Normalas, just a quick question. What is it that you do professionally? I must of missed this in the very beginning. Your adventure has been amazing. I look forward to every update. Keep up the adventure and be safe my friend. Those plans are in the making, Mhamed and me are thinking to do Africa together once he's done with Europe - keep watching! I wonder if they'll come up with a mini-me 300cc KLR to replace original? Don't think it's going to be THAT flexible, they are still expecting to see me in the office at least once a week I think. As I was cruising down the road today and reflecting on my travels through Argentina, and that is the one thing you have loads off on a trip like this - time to think and reflect as the miles pass by, I thought I would give a bit of a summary of my thoughts. It's big, really really big, WAY bigger than it looks on the map. Probably about 70% of it is flat and empty, really really flat and really empty, and although the utter emptiness is a novelty in itself, after 3 weeks of nothing but flat straight roads through the pampas, the novelty has worn off. The most interesting bits are on the west near the Andes for sure, as well as Tierra del Fuego (if you can stand the wind). Buenos Aires, Cordoba and Salta are awesome cities and well worth a visit and they are all in the Northern end. The Ruta del Vino through Cafayate to Cachi and then Salta is fantastic, my fav bit of the whole country. If I knew what I know now, would I go all the way to Ushuaia again just to say I had been there, that is unfortunately an easy one - no. It's just too much flat, windy emptiness. I would have done the circuit I just mentioned above and added BA and Cordoba and then headed up to the Iguazu falls as I did last week. The people were great, especially once I got into the MAI Argentina group and made use of the Motoposadas - the people really made Argentina for me. On the whole, Argentina is a pretty Westernised, modern and a 1st world country, the roads are mostly good although the drivers are pretty aggressive - they are especially bad at sitting right on your ar$e and at speed, which I hate. Pedestrian crossings do not count in this country - DO NOT walk out onto one thinking anyone is going to stop, you will die ! Border crossings are easy and the many police check points are no problem - 99% of them will wave you through on a bike. The food is good to great, but you will have to pay for great. Prices on the whole are cheaper than Chile and Brasil (as I am finding out right now) but more expensive than the rest of South America. The banks will take their pound of flesh out of the tourists with at least a 10% fee on any withdrawal! Don't take Chilean Pesos thinking you will change them in Argentina, no one wants them!! Take USD or Euros, or even NZD ! Just not Chilean Pesos. Overall I really enjoyed Argentina but I don't feel to draw to come back and explore more of it like I do with Bolivia, Peru, Mexico and Colombia. OK, that's about it, I'll do an update on the last few days soon, probably tonight as I am sitting in my hotel room in Brasil watching the rain pound down! 2hardgiveup, fasttortoise, SmilinJoe and 7 others like this. You, Amigo, are a great travel writer! Glad you hooked up with Thomas and Sandra and of course Lisa! Loved Moto RASTA and the bubbly leaky coffin. 2hardgiveup, Robthekiwi, MrKiwi and 1 other person like this. Once the heat subsided a bit in Iguazu, I head out to try and get some stuff done but given it's a holiday and most things are shut, it's hard going. First stop is the ATM at a big bank - says my card is invalid ? never a nice message, bank #2 - card is Ok but bank is out of money.....hmmmm, going to be one of those days..... I do a big hike to a mall that is thankfully open and I find a money machine that is happy to give me money and seems to not charge me a huge fee like the Argentinians do - win! And if you thought, like I did, that my average Spanish would be good enough to get Portuguese, you would be very wrong, I cannot understand a word coming out of these people and without internet I have no google translate so it's back to hands and feet. I can't even understand the most simple thing - like numbers and directions - sh!t !! Then I discover that you can't get a Brazilian SIM card without being Brazilian and that you need a verified Brasil ID number, sh1t! A few shops later and many 'hands n feet' gesturing and pointing to my phone and I find a dodgy cellphone kiosk with a lady who will let me use her ID and set my phone up for 20 real (about $6 USD) - done! The power sockets are also different again so I hunt down and adaptor and return happy but hot and tired to my AirBnB, the three things on my to do list are done! The next day I head out of the city without a real goal in mind and just head East towards the coast, there's a recommended road in the East and Mhamed has some friends in Florianapolis on the coast where I might be able to stay - seems as good a destination as any. The first ride in a new country is always interesting, you get to see their driving behaviour, road signage and whether or not they regard the signs and road markings, seems here they do obey the speed limits to some degree in the cities but otherwise it is open warfare on the road. The roads are in relatively poor condition and there are tons of trucks that have worn deep trenches in the roadway and make for some dodgy manoeuvres. After a few hours I stop for lunch and it seems that here most of the restaurants are buffet meals called "buffet livre", an all you can eat affair and reasonable priced at around 15 to 20 real (about $4 to $6 USD) - this is not going to help the waistline! He takes me to a reasonably budget hotel but the rates are high here and I end up paying 75 real or about $20 USD, but at this stage I just want to get showered and dry, it's hot and steamy and I am dying in my suit. The forecast for the next day is dire, heavy rain all day and for the next three days! I can't afford to wait for three days and decide to head out early and try and miss the worst of it. So I'm on the road by 8am the next day leaving the hotel with the crotch-funnel on and heading East. I do manage to avoid the worst of it but get totally soaked by a downpour that just goes straight through the rainsuit, my riding gear and me.... at least it's not cold and not too hot with the cloudy day! 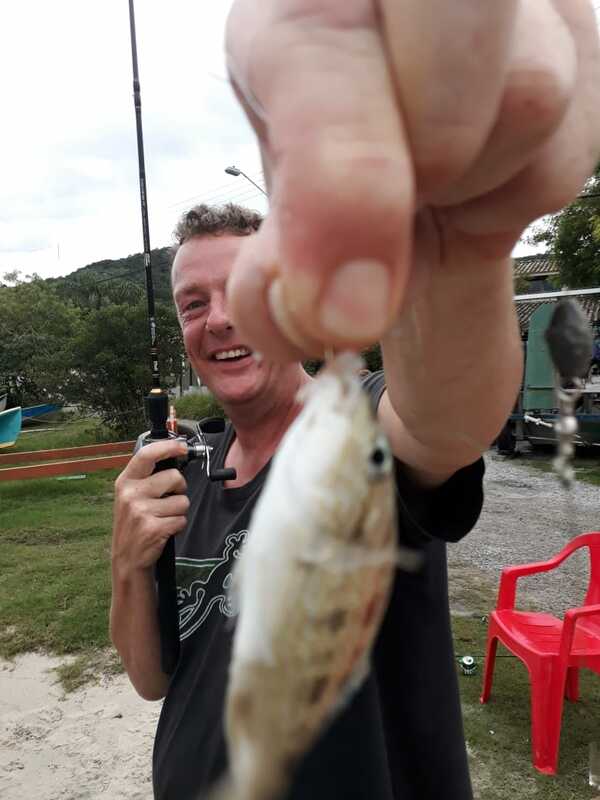 I'm in touch with the MAI Brasil group but it seems they don't have that many members and not many motoposadas which is a shame, although I do get some good advice on hotels and roads in the area. I have a rough target of the town of Lages but as the rain sets in again in the afternoon I decide to stop at a random roadside hotel next to a gas station and settle in for the evening. Sorry about the boring pics! There's not much to take photos of here and I mostly ride through planted forests and wood-milling towns. But a new country also means a new bottle ! Ginger whiskey ? who knew, actually not too bad and pretty cheap at about $6 USD from the gas station next to the hotel. The forecast is again dire with heavy rain all day the next day over the entire region to the coast starting at around 10AM, I decide to hit the road early again and am in the crotch funnel and on the bike by 7:30 am - almost a record! The skies are very dark but I am happily surprised to see the clouds lift by mid morning and I even take the suit off after a coffee stop! My aim is to so get near the Rio do Rastro - apparently the best biker road in the country with loads of twisties through the only mountain region they have here, between me and the coast. I take a few gopro videos of the ride but to be honest it's not that exciting riding, although nice to have corners and hills. The weather stays good and I decide to push on and make great time reaching the top of the Rio do Rastro just before lunchtime. And meet a couple of nice bikers from Uruguay, nice to be able to speak Spanish again and makes me appreciate how good my Spanish is! Here's the view down on the famed road, and it does look good! I'm also in touch with Celby - Mhamed's mate from Florianapolis and let him know that I might reach him today and all is good there. Here is the video of the ride down, it really was pretty spectacular. 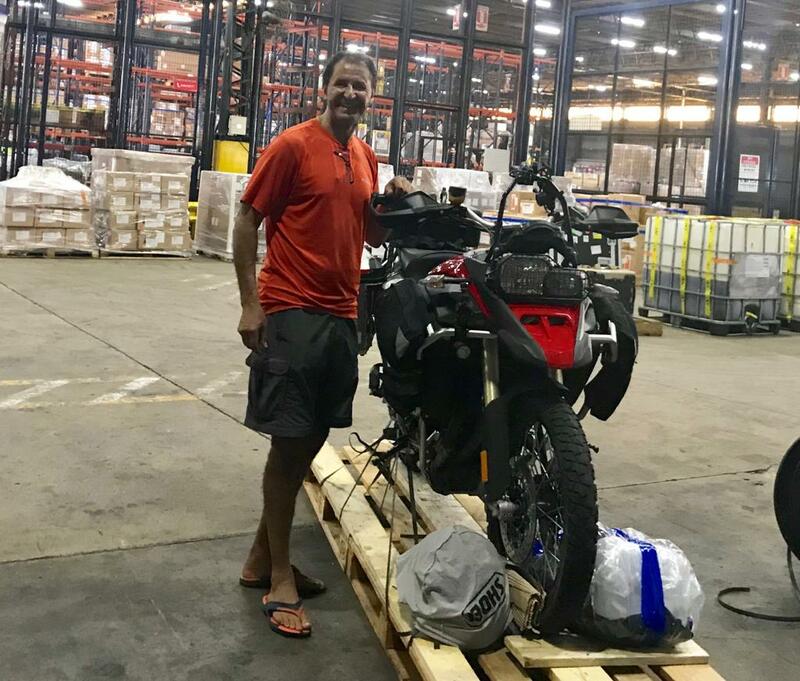 It ends up being a huge day for me at about 8 hours in the saddle and I have to battle mad traffic for an hour or two to get through the city of Florianapolis but finally reach Celby's shop and meet him and his girlfriend who are super nice and welcoming. This is the photo I send to Mhamed just as he is loading his bike into an air plane heading for Madrid! We get back to Celby and Mary's house and he takes me on a wee tour starting with his man toys and his campervan which has a big world map on the back with two glaring mistakes. Ozzy is a bit tilted and NZ is not there at all, shame!!! Going to have to fix that with a sharpie! He shows me some spectacular beaches, looking like a beach should - empty! And then back to his shops on the beachfront where I meet his staff, lovely people again, meet Karin and Sophia. This is a full on beach holiday type town and has a great atmosphere - el bueno vida! 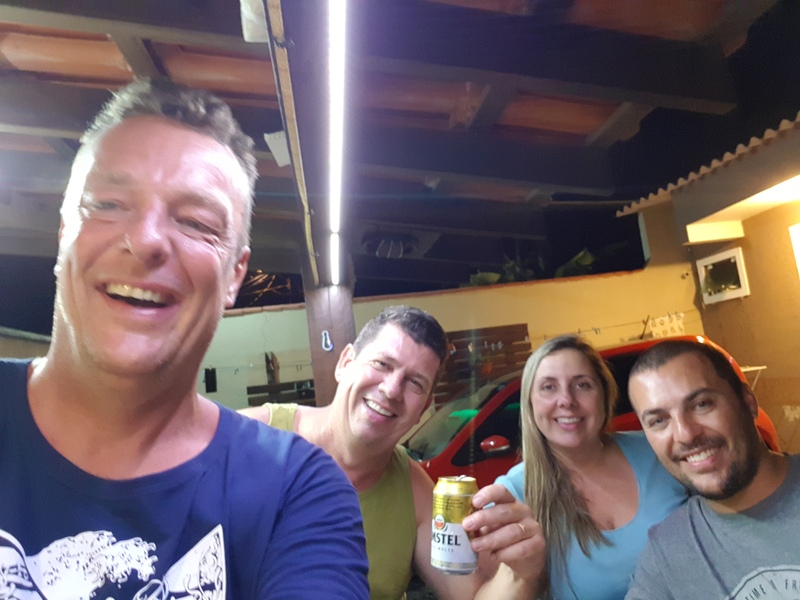 We all head back to his place and they put on a Braziliam BBQ for me and we have a great night chatting away, thankfully Celby speak Spanish and Mary speaks both Spanish and English! And they have a great house with a pool - nice even in the tropical rain. The girls from their shop join us and we have a top night and finish late. No idea what is on the plans for the next few days - will just wait and see how it all goes. All is good on the beach in Brasil!! 95Monster, roadcapDen, SmilinJoe and 7 others like this. I had a good laugh about the map on the van. If you’ve ever applied decals to a dirt bike you can appreciate how an entire country could be sacrificed trying to apply a decal that massive. That would be a 6 beer job at least. Or maybe he was trying to emulate the curvature of the earth and NZ is under the bumper? BTW I’m more of a dog guy but that cat is adorable. Normlas and MrKiwi like this. windplay and Normlas like this. I realise the position is a bit squewiff, but look at what I had to work with! windplay, Vrode, 95Monster and 5 others like this. I start with a new fruit of the day, goiaba (guava) - and you eat the whole thing, skin and all, very tropical and yummy. Then Celby takes me on another wee tour around the peninsula of Florianopolis, starting at a huge dune use for sand-surfing. And we shoot down to a large fresh water lagoon and take a boat ride across to a small village with some nice little lagoon-side restaurants because it's clearly time for a break after our arduous morning. Where we enjoy a great and much deserved seafood lunch, yum! The next day and Mary starts by making churros for her shop and me an Celby head out to the man shed to help a friend with his campervan do some upgrades, I fix the world map the best I can (even including Steward Island!!) before we head home and it's time to give the girl some love. I do an oil and filter change, clean and tighten the chain when I notice I have lost my chain-slider, a rubbery thing that protects the swingarm from the chain. I remember hearing something go through the chain the day before but I had thought it was just a little rock, now I know it was actually the top of the chain slider. It's the U-shaped rubber thingy in the pic below. Unfortunately, they don't sell KLR's in Brasil and don't have any parts so we have to go back to our #8 roots and improvise with this awesome fix - a heavy duty drive belt cut to length, glued down with industrial double sided tape, fastened at each end by the chain guard bolts and extra tie downs using heavy chrome plated fuse wire. Better than a bought one ! Luckily, it's still a balmy 28 degrees and the beach is still full of scantily clad hot women.. 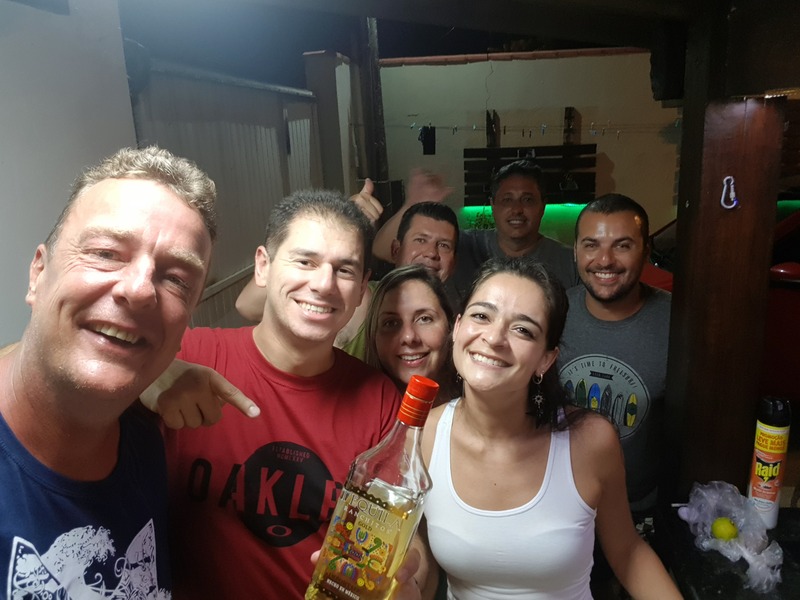 In the evening we celebrate our ingenuity with a bottle of the popular local poison called Cachaca, which is basically a white rum type drink. The next day is Sophia's birthday, one of the girls that works in the Pastaleria shop and so she doesn't have to come to work but they are a man short - only one solution ! Every snack shop in a tourist area needs at least one person behind the counter who doesn't speak a single word of the local language and so I step up !! A fun day was had, but to be honest, since it was so quiet at the shop I spent most of the day eating and drinking the stock, swimming in the ocean and lying on the beach - tough day! In the evening I wander down to the docks and watch the fishing boats come in and sell their catch to the local restaurants and chefs who are eagerly fighting for the best of the catch. Most of what they sell looks like a slightly stretched and skinny red snapper. In the evening we have a birthday to celebrate and all head down to the local 10 pin bowling alley for a super fun night with a great bunch of people. Not wanting to boast but one of us did particularly well given the ball didn't fit my hand and they had no shoes my size so I was barefoot - scoring a 148 and taking the night ! The next day me and Celby head out into the tropical rain and spend the day stand-up boarding around the rivers and lagoons and have an awesome day - some photos and videos of that to come. The day after we decide to take the bikes out and are joined by Celby's mate Marcel and explore the peninsula - perfect weather to explore a paradise of a place. We tour by a bunch of postcard type beaches and have lunch at a beautiful beach-side restaurant. This restaurant was used as the local communication hub before telephones were brought here and they used written notes stuck to the walls, they continue this tradition to this day and it gives the place a very special/authentic atmosphere. And here are our steeds parked up by one of Celby's families houses down on the channel, Celby is on an F800GS and Marcel is on a Yamaha 250 XTZ lander (like a slightly pimped up 250 Tenere). Gotta go and drink a few bevvies with the people that have just turned up, back later, ciao all! SmilinJoe, dano619, 95Monster and 8 others like this. +1000 points for the video of the ride down and the pics! Normlas, HiJincs and powderzone like this. B) You made the North Island look like The Bikers Salute. Not necessarily geographically correct but well done. AC. 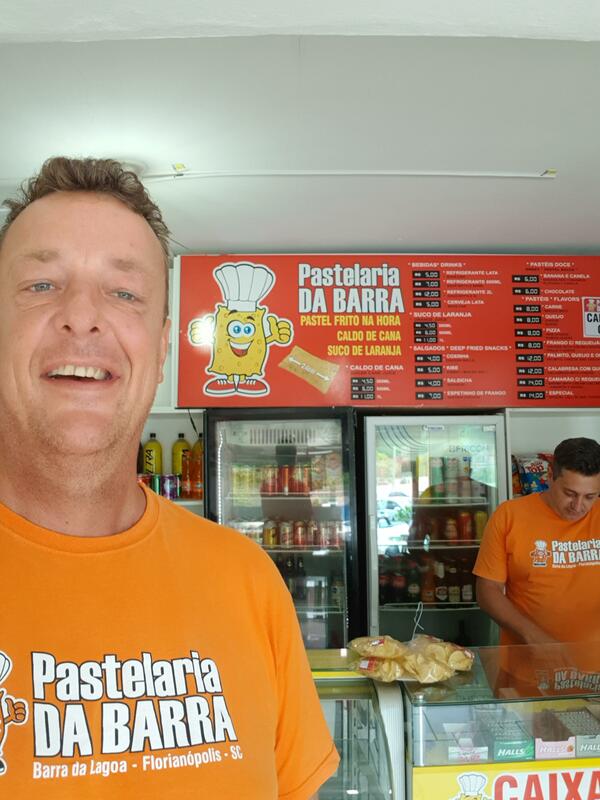 The next day, and because of the rather average weather, Celby decides it's not worth opening his Pastelaria and we have a chill day exploring the neighbourhood. It turns out that there is a stunning beach just a 15 or so minute walk from his house - sounds like a perfect way to spend an overcast afternoon. Half way there and this is the view back to Celby and Mary's neighbourhood, and it is typical rain forest weather at around 30 degrees and 100% humidity. It really is a tropical paradise here, then we cross the big sand dunes before we hit the beach. And the beach is absolutely perfect, squeaky white sand, brilliant blue water and just the odd fisherman around. We have a super nice afternoon, swimming and mucking around on the beach and chatting about life, the universe and everything - la boa vida ! And there really are a lot of tropical fish playing around our feet in the ocean this time. Makes me think back and smile about Rio Gallegos in Argentina where Rolf and I spent Xmas day and we joked about having none of those things in the same ocean. We even do a good deed for the day and pick up some rubbish off the beach and put it in the bins there. Here's a little video of us at the beach in Rio Vermelho State Park. Later that evening we all get invited around to Marcel and his wife's place for a BBQ and a few drinkies, lovely people once again - bikers, go figure ! However, outside of my control things did end up turning rather messy as we were all forced to drink copious quantities of tequila with lime and salt. Peer pressure is a terrible thing, if only I had more self control! 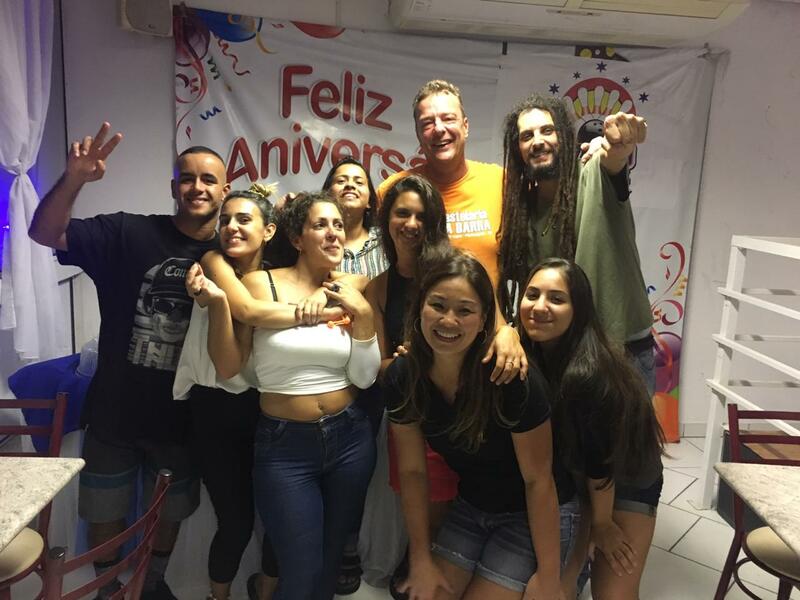 We end up having a huge night and party on till the wee hours, no videos for obvious reasons and the next day is officially a very slow recovery day.....Partying with the locals just never gets old!! 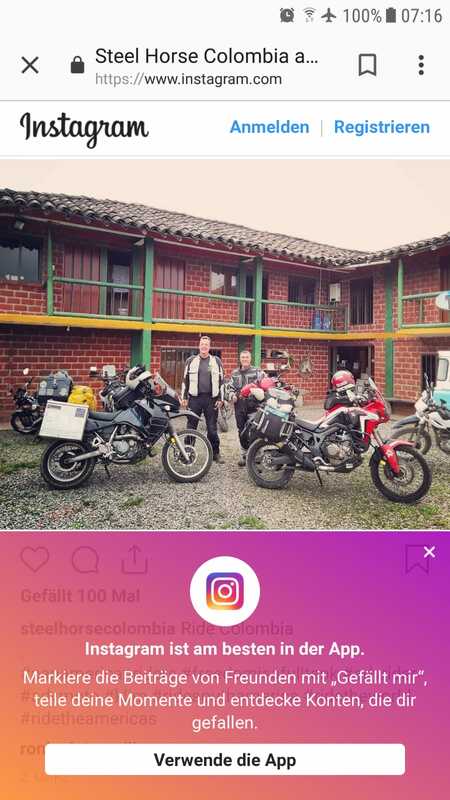 Rolf is currently in Ecuador and whilst looking for some places to visit in Colombia he runs into this photo of Steve and I at the Steel Horse, the somewhat secret Biker's hostel in Filandia, Colombia! 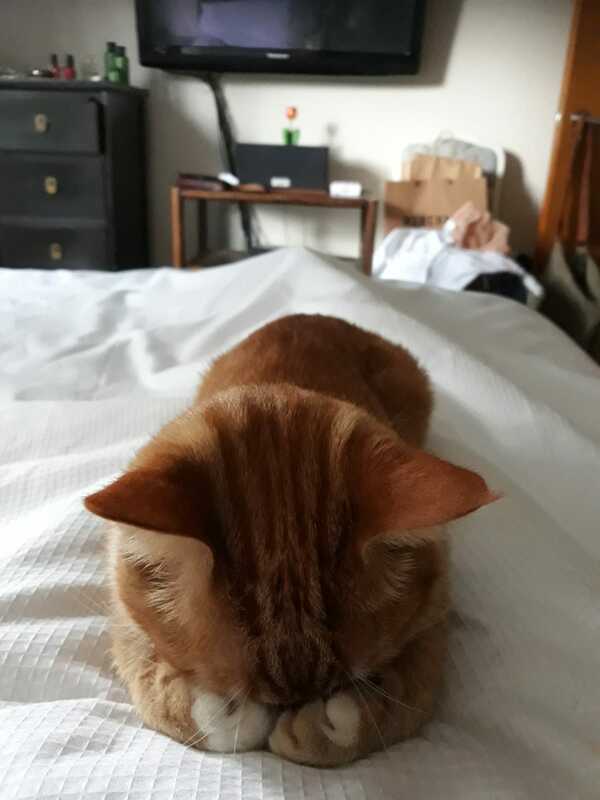 I was planning to head off the next day but we woke to heavy rain that didn't stop until after lunch and the forecast is for rain all day so I am forced to endure another day here. Celby and I head out for another play around on the stand-up paddle boards, we shoot up the river to buy some bait and then return to their (salt water) river side home to spend the day fishing - lovely and relaxed day, and later in the afternoon the whole family turns up for yet another BBQ - all this partying and these BBQ's is not helping the waistline that's for sure. And a new bottle of a local favourite drink - made from some tropical fruit in South Africa - very sweet, creamy and tasty stuff. Our catch for the day was impressive, these fish were easily 20 to 25 pounds each and gave a huge fight, almost pulling us into the water, it was only our awesome fishing skills that stopped anyone from getting hurt, and needless to say the entire extended family will be eating fish for many days to come. 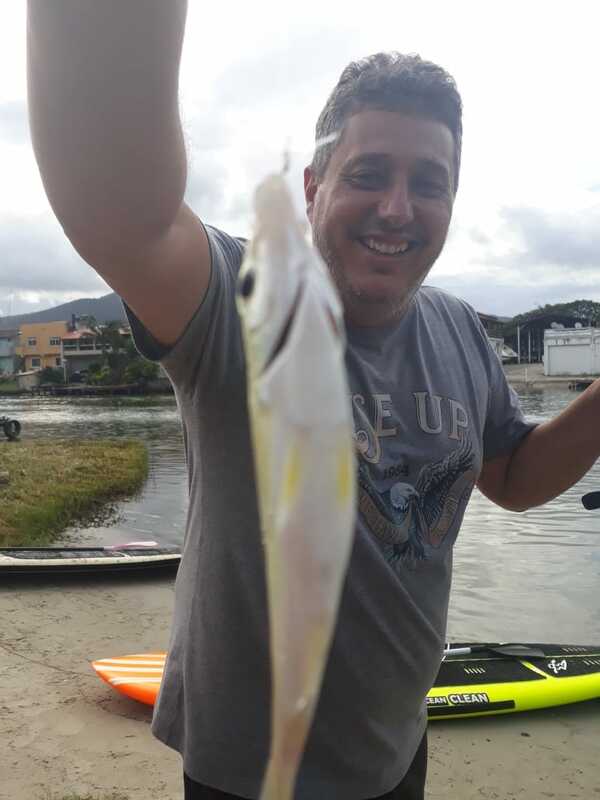 Celby's camera phone seems to have been malfunctioning here and the pics don't show the truly impressive catch that took us an entire day of hard work to pull in! 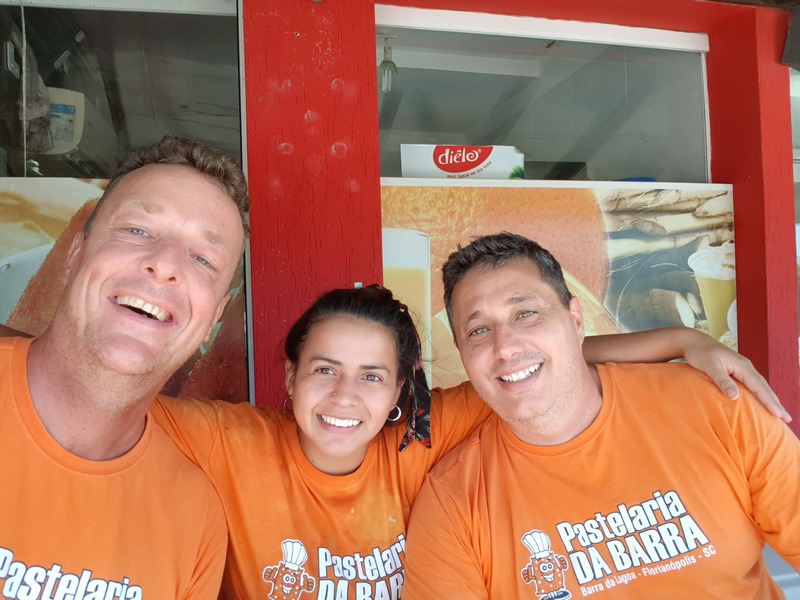 The longer I am spending in Brasil the more I am starting to pick up bits of the language, quite a few words are the same or very similar and as long as they are speaking slowly and in context I am starting to slowly get the gist. Portuguese sounds almost like they are singing it, very tonal and melodic. But others are very different, good day (buen dias) has become dia bom, thanks you (gracias) has become obrigado and one of my new favourite words is the one for knife which has gone from cuchillo to faca - pronounce f*cker - I'm clearly a bad person as this cracks me up every time. So the next day the sky is overcast but the forecast is OK and although Celby and Mary have been absolutely awesome hosts, it's time for me to head off and I am looking forward to hitting the road. They have promised to come and visit me in NZ and I really hope they do so I can return their hospitality and show off our fabulous little country. But this will be the only big city that I will get the chance to see in Brasil, Rio is going to be too far North for my time frame and so I am inclined to give Sao Paulo a go, I have also managed to hook up with a biker there who will receive me and take me to a good hotel in a safe neighbourhood - anyone reading this have an opinion? The next day and it is truly sad good byes as I head off at around mid morning, I just love meeting all these great people and it constantly surprises me how close a bond we form in just a few days, we're all a bit choked up as I head out the gate. The weather seems to have cleared a little and its dry and overcast which is nice - not too crazy hot although the billboard as I leave town reads 29 degrees Celsius and 95% humidity, super sticky. My aim is to get about halfway to Sao Paulo, to a little seaside town with a ferry across a big channel that Celby has recommended to me. The riding is nice, through jungle clad hills and along the coastline although the Brazilian drivers are still rather aggressive, especially sitting crazy close to my ar$e which I hate. The bike is clearly loving the new oil and with the chain re-tensioned and the tire pressures corrected (I had left it way to long between checks and they were both around 10psi low) she is running great, it's good be back on the road. After about a 4 or 5 hour ride I am within 20 minutes of my goal town of Guaratuba when the heavens open up with a tropical deluge, there's not much shelter around but I do find and roll into a police checkpoint, called a rodoviaria here, of which there are many here, and get some shelter for me and bike to wait the rain out. 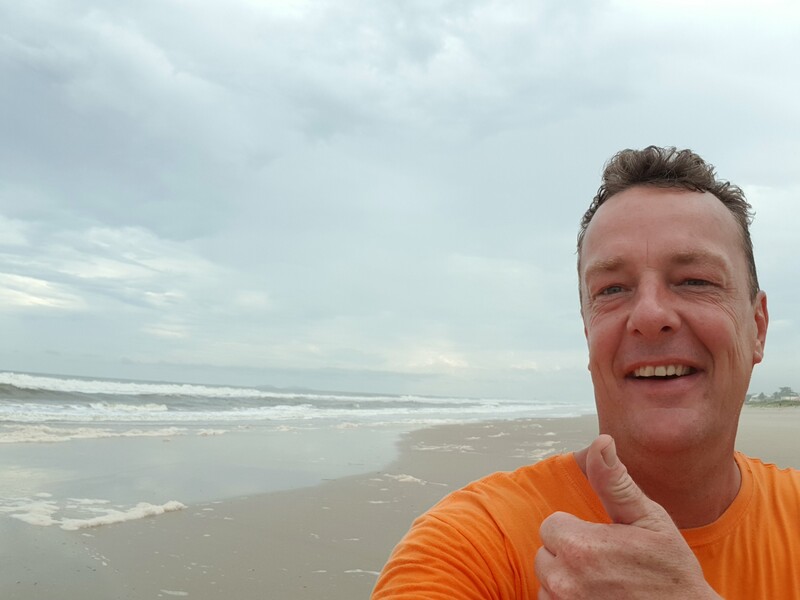 I get chatting with the local cop and ask him for some advice on a cheap hotel and he give me great info on a place just down the road, where I am now, just a few houses back from the beach. The beach is huge and sandy but the water is nowhere near as clean as it was in Florianapolis, probably mostly because of the muddy inland rivers that empty into the Atlantic here. After not riding for over a week and then doing a 5 hour ride my back is giving me some grief today so I'm having a chill day today, all is good on the road in Southern Brasil. Any thoughts on whether to go to Sao Paulo for a couple of days of culture (museums/galleries/ cathedrals) or not are most welcome! powderzone, SmilinJoe, XR Valdeez and 6 others like this. We lived in São Paulo for 4 years way back in the late 90’s. If you like big cities you will like it. Great restaurants and nightlife. Some good museums but not like Mexico City. A lot of bikes, especially Honda 125’s. You have to search to find the attraction of the city but it is there. Still looking good my friend! You be SAFE in Sao Paulo! Normlas, MrKiwi and dano619 like this. Hey Dutchi! U should have drawn NZ horisontal! Then the Springboks would not have a up hill battle to beat the All Blacks! Save travels mate, following you! 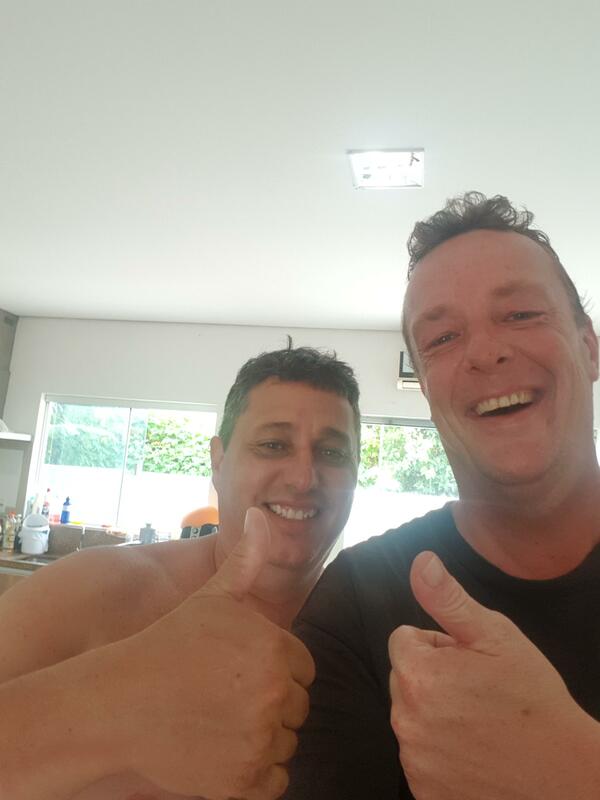 Thanks Gary, after many many warnings from locals and travellers that I was unlikely to exit Sao Paolo alive and with my bike and that it is not that great a city to visit I have taken their advice and decided not to go, you are the only one telling me it's ok but you're not really selling it :) Greetings to the whole family mate! Mhamed and me are still talking about coming your way for the next part of the adventure! Every day the forecast was for heavy rain and that it would be better the next day, and the next day it would say the same.... and it just rained all day, every day .... I had a couple of dry hour one day and went for an quick ride around this little town by the sea. It even had a nice little plaza with a church, although I have to say the churches here and nowhere near as impressive and old as those in the rest of South America. 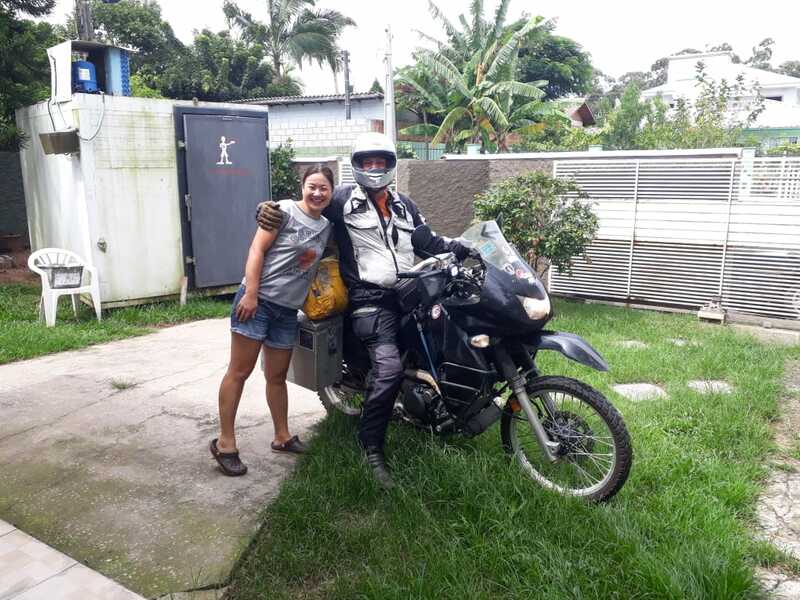 I spend my time chilling and watching movies and talking to other riders via WhatsApp about whether or not to visit Sao Paolo, the resounding advice I get is, "if you go be very careful and do not get lost, you will die", "why would you want to go there?" and "you will not survive this city". The forecast finally changes to "it's going to rain every day for the next week"
I have no interest in waiting around here for another week so decide to just go for it, I'm up early and leave my nice little hotel with the rain suit on - never a good start to a riding day, but I have little choice. Within 15 minutes I am on the ferry across the channel heading for the much recommended road called Serra da Graciosa, slowly heading North up the coast to Sao Paolo - at this stage I'm still not sure if I'm going to go there or not, but no worries, I have time to decide. The Serra da Graciosa road is really pretty, winding through the hills and through the rainforest. here's the Gopro video of that ride. Unfortunately most of this road was made of coble stones which were very bumpy and super slippery, I was happy to get through it and stay upright. This would be an awesome road on a nice day! Then I ended up back on a big highway which was very busy with loads of trucks and heavy traffic and the rain got harder and harder, not a great ride, I end up doing about 5 hours and finish up in the seaside island town of Ilha Compride and get to my pre-arranged AirBnB place owned by Silvia, she was lovely and very patient as I had to change my dates of arrival three times as I was waiting for the rain to stop - in vain as it turns out. 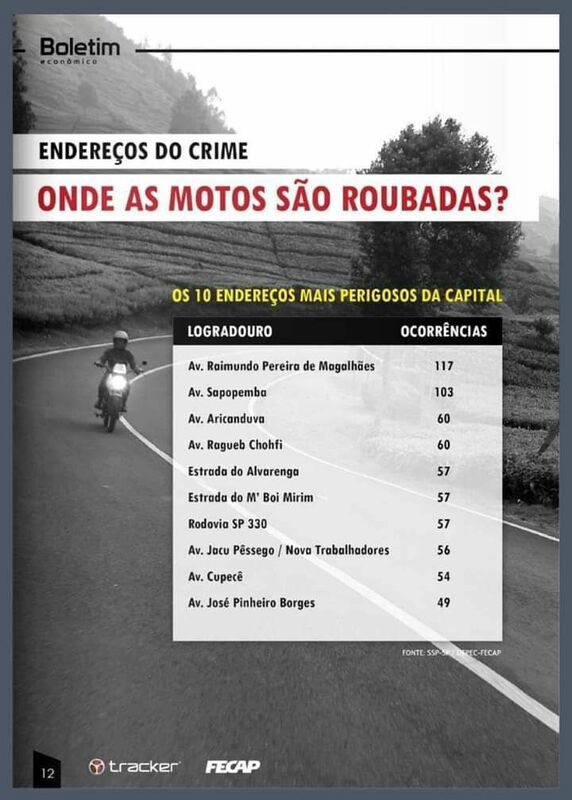 In Brasil there are lots of toll roads and they are kind of annoying as bikes have to pay but the toll is tiny, like 30 or 50 cents, so a big PIA to stop and dig out my wallet and pay that up to 4 or 5 times a day and the toll roads are not better that the free ones, pretty average..... I can't imagine they are actually making any money collecting these tiny tolls. I am told it's all part of a corrupt local system, every Brazillian I talk to tells me the main thing holding this country back is corruption, just yesterday their previous president was arrested for corruption along with most of his cabinet and the president before that is already in jail for the same.....Very frustrating for the people and most of the reason they have now elected a very different kind of hard right-wing president with very extreme views on lots of things, in the hopes he will run a less corrupt government. Makes me happy and proud to live in a country pretty much free of corruption. I finally make the call that I will pass on Sao Paolo and slowly start to head inland again towards the Bolivian border, about 2000 kms away, then I'll see if I go down the amazon jungle and drop back into Argentina or cross the Andes in Bolivia, I've heard some of the passes are already closed with heavy snow falls so I'll just have to see how it all goes. All part of the adventure! SmilinJoe, roadcapDen, 2hardgiveup and 7 others like this.